[X]'Grandpa in mp_strike Call me god! Goodlike U don't have a woman? Wolf Enstein - 2 days 7 hours 23 minutes ago Happy Easter one and all :) . extract this archive into your wolfenstein directory! a little NB! on windows servers, you have to use the ETDED and not ET to get lua to work! tomorrow, 26th feb., all our services will be down for server maintenance. Grab your weapons, sort your teams, get ready for som scrim action and lets make this tourney a big success for everyone. The 3 top placed teams will win an Enemy Territory gameserver sponsored by Splatterladder Hosting, see the details as follows. Both the matchserver and the gameserver you can win are hosted in germany, europe. Depending on how many teams enlist for the tournament, we will play a pre-round to find the top 8 or top 16 teams. If less than 8 teams enlist we reserve the right to cancel the tournament, but we hope this will not happen. In the pre-round each team plays against 2 teams. Maps will be played in stopwatch mode. The Team that wins a map the shortest time earns 1 point. If no Team winds the map it counts 0.5 points for each Team. During pre-round and elimination round each Team will choose 1 map out of the mappool. So after the pre-round the teams with the most points earned will advance to elimination round. In elimination round again each pair of teams will be randomly chosen by splatterladder. But now a match is counted best of 3. that means every Team need to play 3 maps 2 times vs. another Team. One map chosen by each team and one map chosen by splatterladder. Best 4 or 8 advance to stage (semi-final or quarter-final). After the needed rounds we will have a final for 3rd and a final for 1st place. Every Clan may enlist 1 or 2 Teams for the Tournament. We decided to limit the number of Teams per Clan to avoid having 1 big Clan winning all sponsored servers. But you dont need to be in a clan to play in the Tournament, you can also build a Team with your friends. The Matchservers will be set up to 8 slots +1 private, so every Team has 3 players, plus 2 slot for shoutcasters. The matches will also be available on ETTV. Every Player of every Team will need to record demo of the game so if there are any complaints during or after the match we will review the demos of the match and take necessary action. Also a screenshot after each map need to be saved by each team. If a member of a Team dont show up at the set date and time, the Team has the chance to play 2vs3 or 1vs3, if a Team dont show up the Opponent has won. To Enlist you will need to join sl.cup on http://challonge.com/tournaments/signup/uCQ6tRxqkl. Registration is open from today, 11th of February 2015 until the 31st of March 2015. Pre-round matches will be played from 6th of Avril till 19th of Avril, that gives everyone the chance to find a date for the matches. Elimination Round starts from 20th till 26th of Avril, the semi-finals from 27th till 30th of Avril, the battle for 3rd on the 1st of May and the final will be played on the 2nd of May. If you have any questions, ask them now! Splatterladder reserves the right to exclude Teams or Teammembers for every reason. This will not be a greencard for us but will give us the right to handle the Tournament a fair way. So to make this Tournament a as fair as possible event for each and every combatant, we will exclude every cheater from it. If one player of a Team is caught, the whole Team will be excluded. We will have zero tolerance in this case. Since this is the first time that we arrange a Tournament, there may be many things that dont work perfect. Also we dont know if we have to plan for 4 or 40 Teams to participate. We kindly ask everyone who plays in the Tourney for their feedback during and after the event so we can improve things if we ever plan to do another one in the future. The Tournament will be hosted with 16 Teams participating. If you are too late and register at challonge as Team number 17 or later, you are not participating in the Tournament! So move quick if you want to take part. Ladies and gentlemen, we can finally announce the next Gameday! After almost two months of diet who can deny our need for another party? 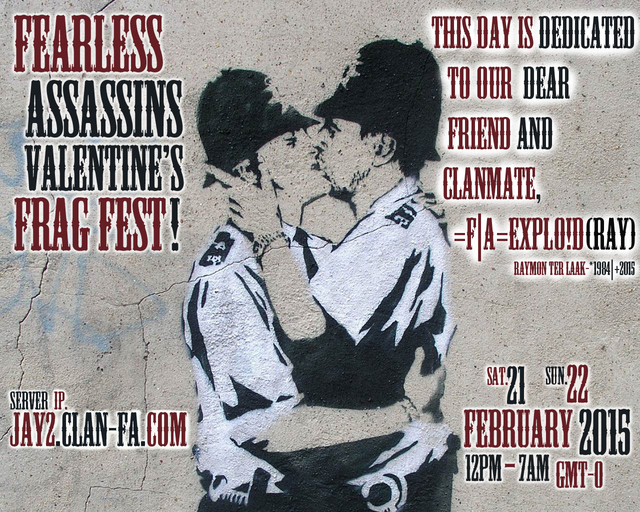 The event staff is happy to announce the =F|A= Valentine After Party. Wars: panzerwar, sniperwar and of course normal fights. Crazygravity available. 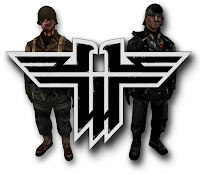 is custom skin, model, and sound pack for Wolfenstein Enemy Territory. -If you do not like custom sounds, you can simply remove sound folder from *.pk3 file. -Using WinRar od 7zip open z_DARK_MULE_v0.2.pk3 file and delete Sound folder from package. - That will restore sounds to original setup. (Note:) make sure to enable download "cl_allowDownload 1"
The brain behind splatterladder has brought a new idea to life to contribute a very easy, very affordable possibility for everyone to host an own Enemy Territory Gameserver for a ridiculous low price of 6.40 EUR per month on a gentlemens agreement base for a 32 slot Gameserver. I repeat that for you to assure you have read right: 32 slot ET Gameserver for 6.40 EUR per month! HOW IS THAT POSSIBLE? The one or other of you might ask. A suitable Root-Server would cost about 70 Euro / month + round about 100 Euro setup fee (Intel® Xeon® E3-1270 v3 + 32GB ECC Ram + 2TB HDD [raid1] + 20TB free traffic @ 1Gbit/s [they assure at least 200Mbit / s] , after 20TB the speed will be lowered for the remaining days of the month.) This configuration should be suitable for round about 12 - 15 gameserver with 32 slots each. Lets do an example with 12 Gameservers: 12 x 6.40 = 76.80 EUR per month. That means the setup fee will automatically be paid after 15 months of continous rental from the serverhost (6.80 x 15 = 102 EUR). WHAT DO I GET FOR MY MONEY? This is also a good question. We can´t deliver 24/7 support or any fast response if there occurs a problem. What we can do is offer you a pretty nice and easy to understand Gameserverpanel with ftp support to upload your files. You may ofc. use any other ftp client. Within the Game Manager you have the chance to fast start / stop / restart the server, watch a basic Game-Monitor and we guarantee daily backups of your server. WHAT IS THIS GENTLEMENS AGREEMENT THING? We dont want to bind you with a long term contract or a big payment in advance, so we thought the best way for anyone to try it out would be to pay on a monthly base. If too many people try the service and cancel after one month we will have to pay the due for the rented Server, so we would like to see you keep it longer than one month only To be honest, we do not believe that you will cancel it, after you have tested it. We have preinstalled the following mods as templates so all you have to do is choose a mod, upload your files, edit the server.cfg and mod.cfg and then start your server. WHAT ABOUT LAG? Whats that? You can test it yourself on two servers that use our new Splatterladder Hosting Service already. Check it out on one of these early testers Gameservers that use our new feature for some days now. If we got your attention with these lines, we look forward to see you grabbing your own ET Gameserver asap. Splatterladder Just a few weeks ago we opened the box of pandera with starting tracking of more then only ET & RtCW, namely the launch of ioUrban Terror tracking. Today we are proud to present you splatterladders Call of Duty section. This is still in beta phase, but we decided to open it for you. Please don`t hesitate to drop a post in our forum if you find any bug or missing text. Fully compatible rating and ranking of all supported versions, measure your skill and beat the enemy! Have fun using the newest sl.supported games and compare to your friends. And never foget - splatterladder is watching you! Splatterladder Time has come to announce the next step in splatterladder history: Multi-Game-Support. splatterladder.com - your first source for playertracking and ranking is expanding with a lot of games to reach a new audience step-by-step. The first games to be added beside rtcw/et and new added ioUrban Terror will be Call of Duty 1, 2 and 4 together with Quake3 (io Quake). If you want to take the chance to participate in these new sl.games with player- or serveradminsupport feel free to get in touch with us. More new games will be announced after they are implemented in a beta state. Subscribers of splatterletter (Â© by splatterladder.com) get to know great news like this always a few days earlier - subscribe now. Splatterladder.com relaunches the free voice server hosting with improved speacial features! announcing of joining or leaving mumblers on your ET Server. support of mumble channel viewer protocol. Splatterladder From now on we offer you the ability to subscribe (and ofc. unsubsribe if you dont like it) for the Splatterletter. The unique newsletter of Splatterladder. With this Splatterletter we will inform you in irregular intervals about new developements around the sl so you can stay informed even if you dont visit our forum every day or week. To keep it simple you need to be logged in with your sl-account and navigate on the mainpage to the upper right corner of the site. The box "Pad & Letter" contains the link to subscribe to our newsletter. You can also very easily unsubscribe to it, you just need to follow that link a second time. You dont have to supply an emailadress during subscription, the newsletter is automatically sent to the email adress that is registered with your sl.account. If you have any questions please visit our forum. Splatterladder The sl is continuously serving you new features step-by-step to serve you with the best experience. Our newest service is a textpad where you can invite your clan or friends to and share private information fast, simple and secure. The stunning feature is that you can simultanously work inside the pad. You can see what others are posting live and start writing inside their post at the same time as they do. You can easily create an own pad, set a password to secure the adminsection and start inviting your friends. Noone will be able to see what you and your friends share through your pad since it is password-protected. If you have further question to this enhancement - feel free to reply.